Three functions in a single pen. You have a Capacitive Stylus, LED Flashlight that is turned on by pushing on and pushing again to turn off. Then it also is a black ink pen. Pen has Chrome accents, button cell batteries, included, brass barrel. Dual Color Black brass barrel/Chrome pen. These lighted pens are the best! Our new Crowne Triple Function features a black ballpoint pen, a bright LED light and a capacitive stylus good for all touch screen devices. Your custom logo imprint on barrel are workable. 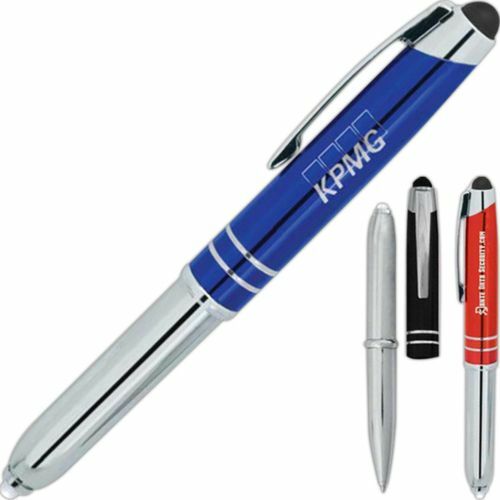 Find more of our flashlight stylus pens. It’s special dual tip mini version with cap. We also supply common version light pens with flashlight on top.